Incredibly, “income inequality” is a buzz word this election season among Democrats and Republicans alike. It’s encouraging that this issue is finally getting attention, given that a year ago the plight of working class and poor Americans was not a topic of discussion among most politicians and the mainstream media. But few people are talking about how climate destabilization, arguably the biggest threat we face as a planet, exacerbates income inequality. That relationship holds as true for the U.S. as it does for the developing world, where it’s easy to imagine how poor people might suffer more under extreme weather conditions. Typhoon Haiyan overwhelmed the Philippine government, which is still struggling to restore electricity and temporary housing. Food prices are skyrocketing, making life even more difficult for people whose jobs washed away in the storm. 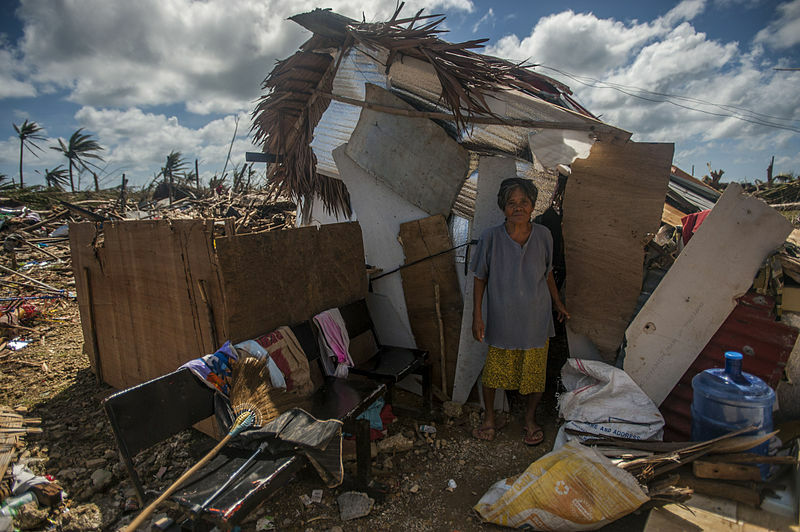 Although U.S. infrastructure and budgets prevent devastation of the magnitude we saw recently in the Philippines, those with less still suffer more here. In New York and New Jersey almost 700,000 housing units were destroyed in Hurricane Sandy, leaving more than that number homeless. In New Jersey 19,000 small businesses suffered losses of $250,000 or more, and total business losses in the state are estimated at $8.3 billion. Those losses translate to lost employment for working and middle-class Americans. When climate disasters strike, we can see in starker relief the difference between the haves and have-nots. But what about income inequality created by the industries that contribute most to global warming? Take the case of West Virginia, which ranks second from last in terms of median household income; 47 percent of children there live in low income families. For several days, a chemical spill from a coal processing facility left 300,000 West Virginians without any water to use for drinking, bathing, or cooking. Not only did the contaminated water make people sick, people had to buy bottled water and even cover the cost of flushing their pipes. Some probably also lost days of work without pay, since West Virginia employers are not required to give paid sick leave. These are just a few examples of how people who are living at or below the poverty line are disproportionately impacted by the cost of fossil fuel production. Lower income households suffer economically from transport of fossil fuels too. Here in the Pacific Northwest, two export terminals are proposed to ship coal that will be transported on open rail cars from Montana and Wyoming. Burlington Northern Santa Fe estimates that 500 pounds of coal dust will be blown off en route. Surrounding communities will have to deal with the respiratory illnesses, including emphysema and bronchitis, that may result, and the cost of treating them. Property values will probably take a hit too. One study estimates a 5-20 percent price devaluation for single family homes in northern Puget Sound near the routes. A home is the single biggest asset for most middle and working class families, so depreciation of that asset represents a significant decrease in wealth. And of course, as those fossil fuels are burned, economic impacts go global. A 2012 study conducted by 50 scientists, economists, and policy experts found that global warming is reducing the global GDP by 1.6%, or more than $1.2 trillion. By 2030, that same dollar amount could be the cost of climate change to China’s economy alone. The poor, working classes, and middle classes in China–and in the U.S–will pay more than their fair share, because income inequality and climate destabilization go hand-in-hand. So let’s open our eyes to the fact that the fight against poverty must address the fight against global warming, and vice versa. Wow, brilliant! Send this post to President Obama immediately. Surely, this information will hit home. You make so many fabulous points. When my class gets to the readings on the environment, I’ll have them read your post. Why the hell aren’t policy makers connecting the dots as you do? I love how you bring the issues home. It’s easy for people to see the impact of climate destabilization on poor countries around the globe, but for them to see the impact here, from declining home values to lost work due to chemical spills, is super powerful. The ways you link the issues of income inequality and climate destabilization makes for a movement in itself. When are you going to start your speaking tour? Consider a run for senate. In any case, thank you for linking these issues and bringing them home. Please keep speaking out and connecting the dots for us. Thank you, Wendy! And please invite your class to comment or even write a guest post if they are so inclined. I agree–the more conversation we can stimulate, the more visibility we can give these issues, and the more people will see how intrinsically connected they are.